Samsung Galaxy S5 is tagged among the latest high-resolution phones these days. This means that the Galaxy S5 is cabable of producing much and much more detailed photos than its rivals. 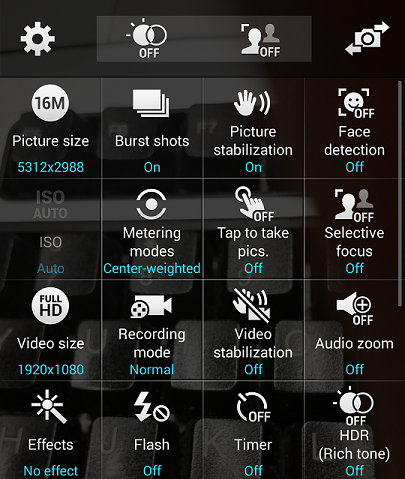 This article elaborates a detailed guide to manage and configure camera settings on your Samsung Galaxy S5 smartphone. Please read on if you need to know more of your phone's camera setup. 1. Tap Apps from any Home screen to get started. b. Burst shots - This camera option can be turned on and off. c. Picture stabilization - This camera option can be turned on and off. d. Face detection - This camera option can be turned on and off. e. ISO control - To set the sensitivity of the camera’s light meter. f. Metering modes - There are three metering modes available on the GS 5 camera, including center-weighted, matrix, and spot. g. Recording mode - Recording modes on the S5 include normal, limit for MMs, slow motion, fast motion, and smooth motion. h. Video stabilization - This option can be turned on and off. i. Auto zoom - This option can be turned on and off. k. Flash - This option can be turned on and off. l. Location tags - This option can be turned on and off. m. Storage - The Galaxy S5 camera storage would include device and memory card. n. Review pics/videos - This option can be turned on and off. o. Remote viewfinder - This option can be turned on and off. p. White balance - Options under White balance settings would include auto, daylight, cloudy, incandescent and fluorescent. r. Guidelines - It's an on/off option. s. Shutter sound - It's an on/off option. t. Voice control - It's an on/off option. q. Help - To access phone camera support. r. Reset - Option to restore to default camera settings. These are the steps to change the camera storage location on the Galaxy S5 internal memory (ROM) or SD card. 1. Touch the Apps icon from any Home screen. 2. Touch Camera to continue. 3. Touch the Settings icon on the upper-left corner of the screen. 4. Touch Storage to proceed. 5. Touch from either Device or Memory card option to store pictures on your Galaxy S5 handset.